This position description intends to describe the general nature and level of work being performed by people assigned to this job. It is not intended to include all duties & responsibilities. 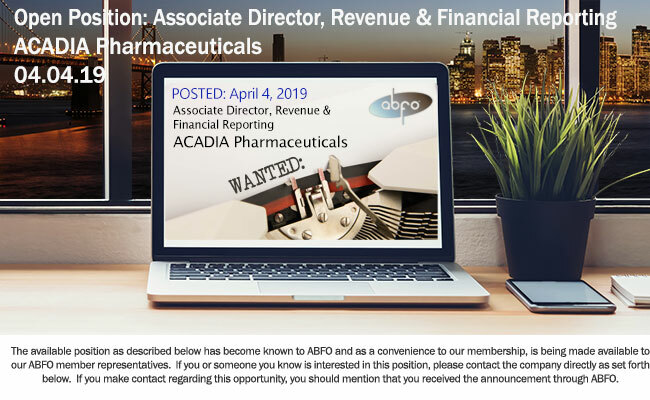 ACADIA is a biopharmaceutical company focused on the development and commercialization of innovative medicines to address unmet medical needs in central nervous system disorders. ACADIA has developed and is commercializing the first and only medicine approved for the treatment of hallucinations and delusions associated with Parkinson’s disease psychosis. In addition, ACADIA has ongoing clinical development efforts in additional areas with significant unmet need, including dementia-related psychosis, schizophrenia inadequate response, schizophrenia-negative symptoms, major depressive disorder and Rett syndrome. Reporting to the Senior Director, Controller, this position leads all aspects of SEC reporting, technical accounting and research, SOX compliance, and revenue accounting. The successful candidate will be joining a Finance team whose focus is to drive value for the business and should be ready to learn and adapt quickly in a dynamic environment. The ideal candidate is a technical, detail-oriented licensed CPA with biotechnology or pharmaceutical and Big four audit experience that can work collaboratively and independently and is driven to get the job done with excellence. Researches and prepares white papers on the accounting treatment for various topics as needed, including revenue recognition, lease accounting, business combinations, etc.